Three-quarters of IT professionals believe that the “Internet of Things” (IoT) will impact the workplace; however, more than half haven’t yet begun preparing for this development. The implication of IoT is the continued increase of internet-connected devices that generate data, use up bandwidth and IP addresses, and put company data at an increased risk of security attacks; understandably, 86% of IT pros are concerned about the security and privacy issues that will result. 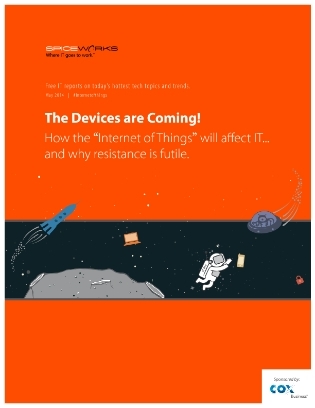 This informative report provides insight into what others are (or aren’t) doing to prepare for the invasion of devices in the workplace, as well as the changes that your enterprise should anticipate in the coming years. Read now to become better informed about this highly relevant subject and to prepare for the continued influx of devices into your organization.